It truly is font-astic with special guest featuring hand letterer, KA Designs! Ever wondered how your handwriting came about to be how it is today? It’s something that you were taught since you were young that has become an automatic cognitive process applied nearly every single day of your life and yet, we’ve now got you wondering, “How did I end up with this handwriting?”. The introduction to National Handwriting Day began in 1977 was established by the Writing Instrument Manufacturers Association as an effort to promote the consumption of pens, pencils, and paper. January 23rd was the chosen date to honor John Hancock’s birthday — the first person to sign the Declaration of Independence. Throughout history, handwritten documents have created historically changing moments from ancient scriptures, the beginning of world wars, establishing peace, declaring independence, to freeing slaves, and so on that makes it unique. 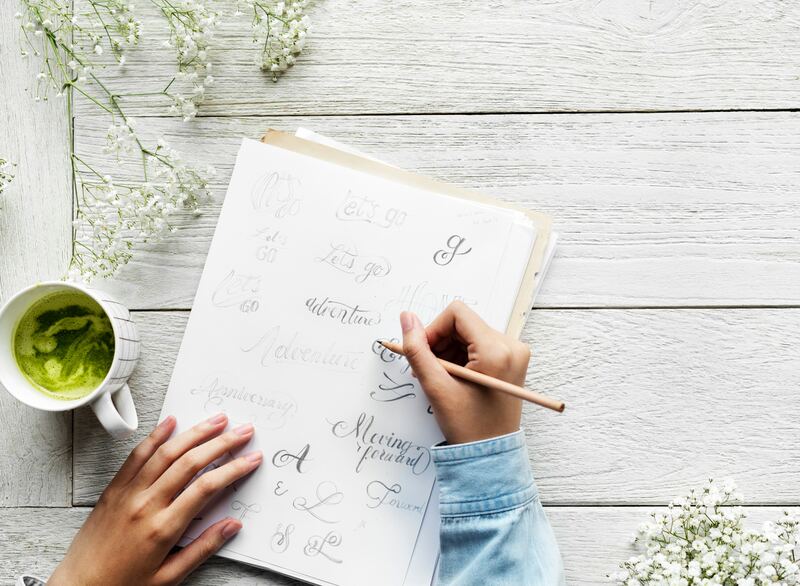 Despite handwritten documents causing symbolic changes in history, the art of handwriting is unfortunately gradually becoming lost as our society succumbs to the development of technology. TheHungryJPEG, on the other hand, values the beauty of the artwork, historical background, and significant purposes, of handwritten work. We see the importance of National Handwriting Day as it is increasingly relevant in today’s world. Therefore, TheHungryJPEG celebrates this day! There are many ways to shed light into the diminishing interests of handwritten work with the spirit of this national celebration. With the growing usage of computers, tablets, and phones, why not shift the wonderful art behind handwritten fonts, calligraphy, and typography into vectorized formats with useful technological art tools such as the Apple pencil and an iPad, or simply by scanning it to your computer to save it as a vector image. Just to be clear, lettering and typography can be quite difficult. So, get out your pen and paper to start your sketches, or simply check out the eye-grabbing fonts below for some inspiration. Sharing more insights about digital hand lettering is none other than one of THJ’s top handwritten font contributors, KA Designs, who is also our featured font designer for this year’s National Handwriting Day! Ranging from bold fonts, to script fonts, to brush fonts, KA Designs’ typographies can evoke the emotions of happiness, laughter, joy, and romance with her unique designs. Read more about KA Designs to learn about her devotion to her hand lettering work, inspirations, and love for TheHungryJPEG! What inspires you to create your handwritten fonts? Although, I find a lot of my inspiration right here on THJ. Just looking at the wonderful designs available, motivates me to either finish that project I’ve been working on or start something completely new. Another place I look for inspiration is Instagram. There are so many photos and videos to look through. It is also a great place to connect with other designers and take a peek into their designer and personal lives! What skill are required when creating handwritten fonts? Design Program Skills – There are tons of font making programs out there. I think that the level of experience that you have is important in picking out what fits you best. Experiment with as many programs as you can but hold on to whatever works for you. You can always move on to new programs as your experience grows and you learn more about the process. Patience – You’ll need a lot of this. Handwritten fonts are just that – handwritten. Sometimes, things go together and the letters are perfect on the first try. Other times, that is far from the case. I might write one single letter fifty or more times before I am happy with the look and flow that the letter has with the font I am creating. Authenticity – Just be you. There’s a million designers out there and the amount of inspiration that you will get by simply just looking through the products on THJ is more than enough. With that being said, it is so important to stay original and find your niche! Willingness to Learn – There is always something new to learn about font making. I began with very simple fonts. I can remember dreaming of one day being able to create a more authentic, handwritten look. After much trial and error, I found that achieving this look came simply from changing the writing tools I would use – such as brush pens or markers. Most of the skills that I’ve learned, I’ve taught myself. Whether it was from reading articles, watching tutorials, studying different methods and tools – you name it, I’ve tried it! I think that I can relate a lot to the person who wants to start making their own handwritten fonts but has no prior training. Just as with anything in life – if you have the will and the passion, you can be successful! What inspired you to sell your fonts on THJ? I have been making my own fonts for about six years now. I spent a lot of time teaching in elementary classrooms. Throughout that time, I noticed a lot of outdated books and teaching materials. I started to design my own classroom resources and from there I began to create fonts to go with them realizing quickly how much I enjoyed making each and every letter. Typing that first word and seeing each letter come together will always be my favorite part of the process! At first, I made them just for my own designs. When I found out about THJ, I loved everything about it! I am so happy that other people can now use my fonts to create their own designs. The THJ team is also what keeps me going. They have been so helpful and amazing since I’ve joined. I think that really goes a long way – when you can work together and inspire each other! I only wish I had found out about THJ sooner! In lieu with National Handwriting Day, TheHungryJPEG will be giving away KA Designs “Timeless” font as our featured weekly freebie of the week! You can download the freebie font right here at this link. Or you can check out more of KA Designs wonderful collection of handwritten fonts below. Look for more quirky fonts today that’s a little silly, fun, and yet charming. Unlikely Friends is a cute & quirky font. This font is perfect for quotes, headings, designs, logos, invitations and more! Capital Letters are a scribble outline. Lowercase letters are a scribbled outline with fill. Mix & Match or overlay your words for a fun look! Arrows is a doodle (dingbat) font. It includes 52 hand-drawn arrows to use in your designs! All you need to do is install the font and type a letter as you normally would. Instead of a letter showing up, a small doodle will! The perks of being a wallflower is this font! Walk through the valley of wallflowers as you explore the wondrous ways that the letters in this font connect. C’est la vie! Such is life! La Vie is a chic handwritten font with a brush texture. Brush fonts with rough edges are extremely popular with Etsy stores, so you should definitely get yours today. Sweetheart is a handwritten script font with a surprise of 52 doodles included. This font is perfect for quotes, headings, blogs, logos, invitations and more! In love with all of KA Designs’ fonts collection just as we are? Get her font bundle inclusive of 96 fonts for only $19 before it expires on January 31, 2019! More, more, and more handwritten fonts! Handwriting is similar to a fingerprint as each individual has a unique one of their own. Hence, expect each and every font designs on THJ to be as different as can be from others. Here are some brilliantly unique handwritten font choices that you can find on TheHungryJPEG site or the Font-astic! Moodboard to create that one-of-a-kind design for yourself, or for your loved ones. A new fresh handmade calligraphy font suitable for greeting cards, branding materials, business cards, quotes, posters, and more! Introducing Milk Child is an organic, energetic, dynamic and modern handwriting script that can be used for various purposes such as the title, correspondence, wedding invitations, letterheads, signage, labels, signature newsletters, logos, posters, badges, etc. Brittaney is a modern and elegant font with a lot of stylistic alternates for your beautiful project. This font was made carefully so that each letter could be connected well and elegantly either using alternate or not. Feather will look beautiful on holiday invitations, wedding invites and stationery, logos, and more. Definitely worth trying out in your next project! The font file includes uppercase and lowercase, numbers and punctuation, and foreign language support. Introducing the Yellow Pen script — a font that is very fresh and unique style handmade with bonus font, Night in Kansas for your project. The Winter Miracle is a font duo that is ideal for branding and decorating any of your projects, particularly wedding invitations or your blog. Also with the help of these fonts, you can create a logo or beautiful frame for your home. Or just use for your small business, book covers, stationery, marketing, magazines and more. Spoiled is a rough and natural handwritten font. Spoiled is perfect for branding, advertising, poster design, logotypes, book covers, magazines, packaging, headers, greeting cards, apparel designs, merchandise, fashion campaigns, newsletters, album covers, and quote designs and more. Creamy Font includes Upper and Lowercase Basic Characters, Numbers, Punctuation and Ligatures. Creamy Font is also available for Western European, Central European and South Eastern European languages. You can check your language typing characters in text box below. Colette includes alternates and OpenType ligatures such as double letters or alternates glyphs that you can use to improve your designs and make them look natural and friendly like this “Certified Organic Soap” model. It is also designed with a Filled version (you can mix Colette and Colette Filled to give you more design options) and an Inside version (To do so, you can simply superimpose the layers with a compatible software like Photoshop, the weight above and the inside below, then choose a color for each). Each letter has at least one alternate, allowing you to play around and make your text look like more natural hand lettering. The font also includes 30 letter combination ligatures to create better flow. The alternates and ligatures allow you to customize the look of your text, keep it natural and create endless combinations. This font is great for designers – outlining your text in this font allows for further adjustments and alignments to make the script look even more natural and handwritten. This is Jenna Kast Studio’s firsts font release ever! Share with us your idea on how you would celebrate National Handwriting Day! 2019’s Visual Trend Forecast: Make An Impact On Your Audience!